Doug Eadie and David Stackrow have written a powerful, path-breaking book: the first comprehensive, detailed description of the governing function in public transit written expressly for transit board members, chief executive officers, and senior executives, and also for the elected officials who appoint transit board members. Doug Eadie and David Stackrow have written a powerful, path-breaking book: the first comprehensive, detailed description of the governing function in public transit written expressly for transit board members, chief executive officers, and senior executives, and also for the elected officials who appoint transit board members. Doug and Dave have not written an abstract, theoretical treatise on public sector governance. Rather, drawing on their accumulated 50-plus years of work in the public transit sector, they provide their target audience of public transit leaders with practical, thoroughly-tested guidance they can apply in developing the governing capacity of their boards and in building solid board-chief executive officer partnerships that can stand the test of time. 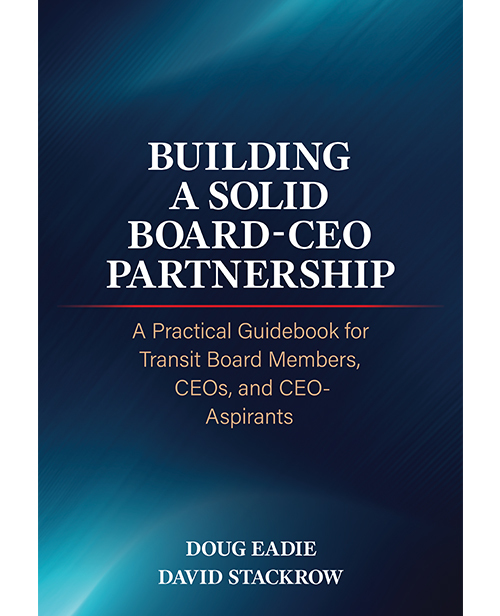 Whether you’re a transit board member, CEO, or CEO-aspirant or an elected official filling transit board vacancies, you’ll want to keep Building a Solid Board-CEO Partnership close at hand, as a powerful resource you can draw on in carrying out your leadership mission.